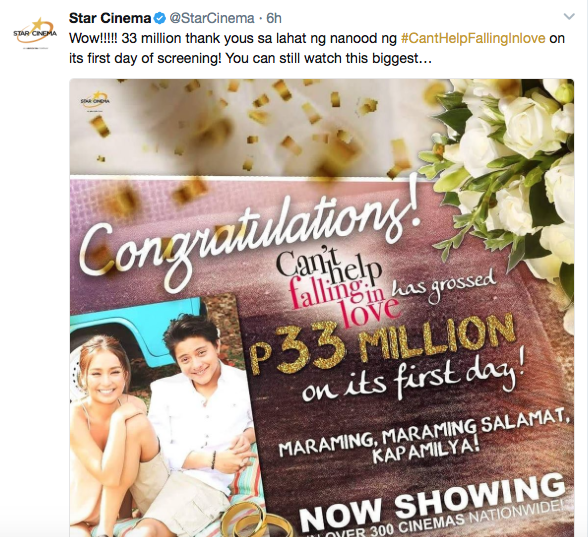 The KathNiel starrer Can't Help Falling In Love reportedly grossed PhP33 million on its opening says Star Cinema. The giant movie outfit also said that it has been the most successful Black Saturday opening for any local movie yet. Although it didn't eclipse the opening day receipts of 'A Second Chance', which holds the record for the biggest opening day sales for a non-Metro Manila Film Fest movie at PhP43.3 million, KathNiels had to be happy with the fact that it did smash the record of the previous Kathryn Bernardo- Daniel Padilla movie. 'Barcelona: A Love Untold' earned P23-Million on its opening day last year. 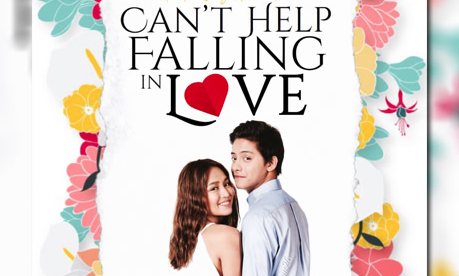 It remains to be confirmed but if its accurate that the movie earned PhP33 million on April 15th, 'Can't Help Falling In Love' could also hold the biggest opening day gross for a local movie in 2017. Have you watched it? Tell us what you think about the movie at the comments section below.